Pinwheels and whirligigs provide a fun combination of colour and motion. 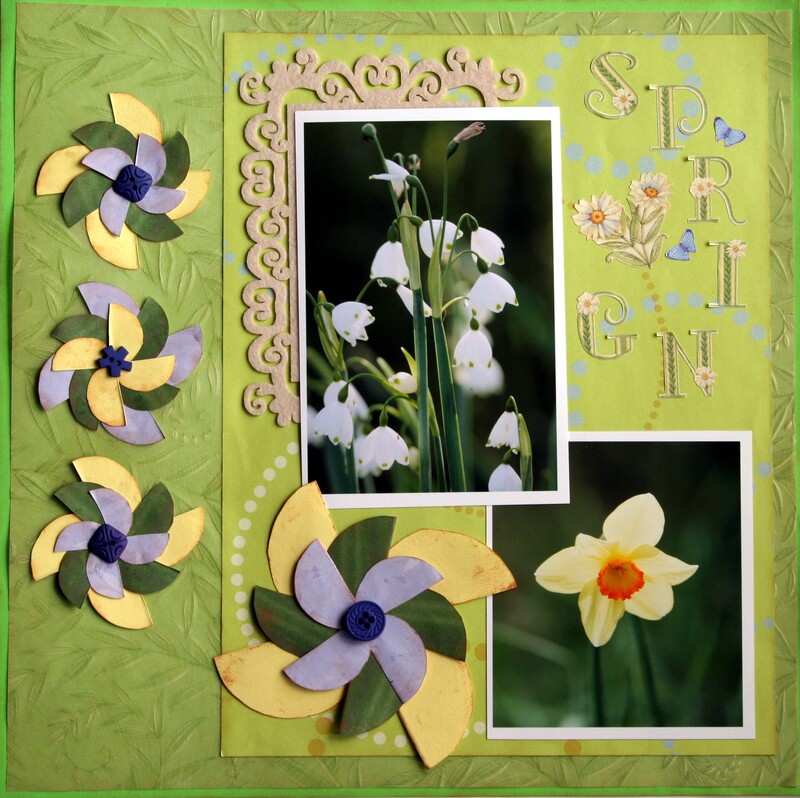 They make a great accent for scrapbook pages, a design element for quilts, and add whimsy to the garden. I wanted to do a bright, colourful page for the beginning of spring, and remembered a tip I had seen in a scrapbooking magazine a while ago on how to make pinwheels. They are easy to make. 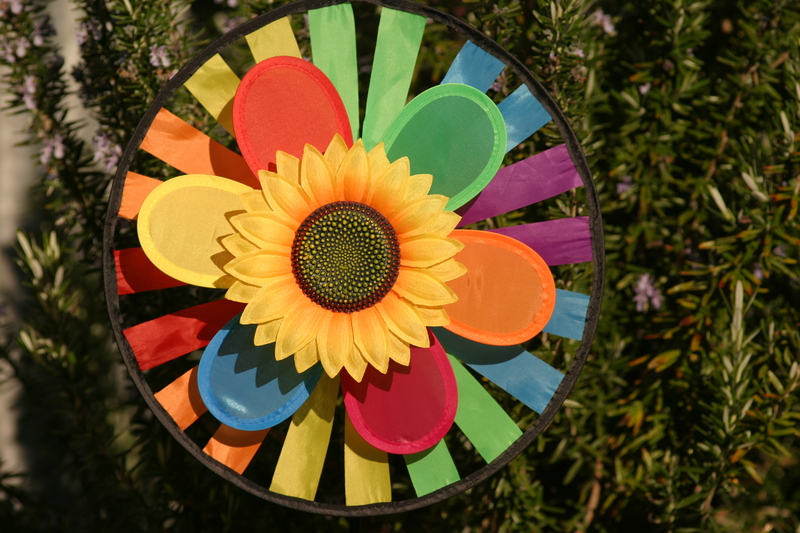 All you need to do to make one pinwheel is cut out two each of three different size circles. Then cut each circle in half. Layer them together with the spinners all facing the same way. Then add a colourful button or brad to the centre. You can make small pinwheels from leftover paper scraps. 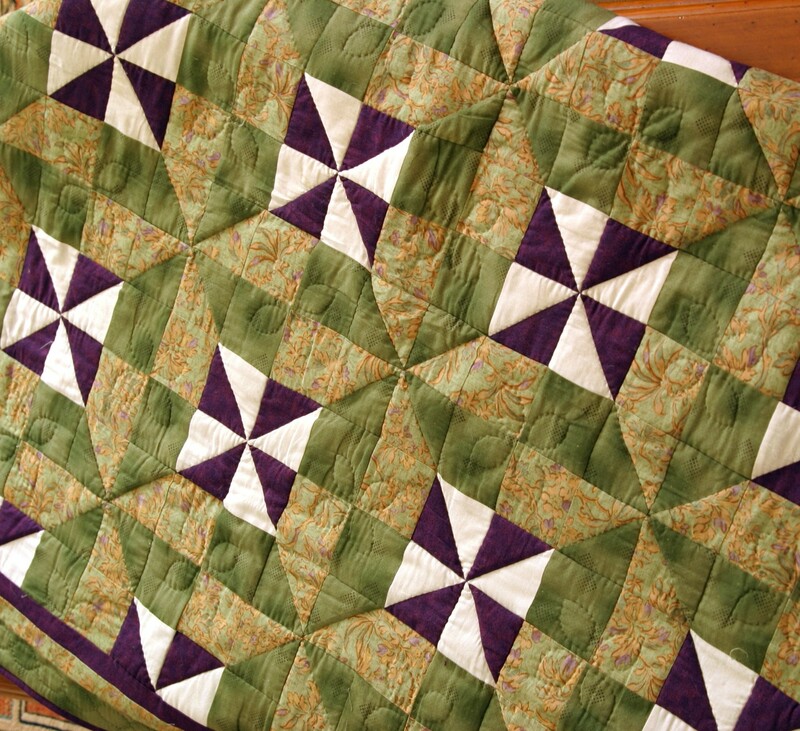 A couple of years ago, I made a quilt with a whirligig design, in my favourite colours of purple and green. The design is called End of the Day and came from the book, More Quilts from The Quiltmaker’s Gift. Whirligigs make a fun addition to the garden, adding a splash of colour on a still day, or spinning cheerfully in the breeze. Whirligigs likely originated from weather vanes, used by farmers and sailors to indicate wind speed and direction. They soon became popular as wind toys, and early whirligigs often depicted figures that moved as the propeller twirled. I love walking through graveyards and seeing colourful whirligigs brightening the graves. In Scrappy Cupcake Angels, a row of whirligigs twirl in the breeze from the narrow strip of garden along the front of Mr. Thomas’s cottage. This entry was posted in My Blog, Quilts, Scrapbooking and tagged pinwheels, scrapbooking, Scrappy Cupcake Angels, Spring scrapbook layout, whirligig quilt, whirligigs. Bookmark the permalink.